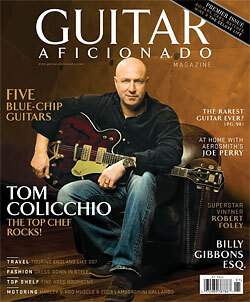 One might assume that the new magazine Guitar Aficionado is a spinoff of the 17-year-old Cigar Aficionado. Both have covers with celebrities holding the featured prop (the chef Tom Colicchio with a 1963 guitar, Jay-Z with a stogie of a presumably more recent vintage). men's fashion, and ads for cigars and speakers. Also, both titles include the word "aficionado." Greg Di Benedetto, the publisher of both guitar magazines, said Guitar Aficionado was aimed not at young hard-rock fans, but buyers of $6,000 guitars who would also buy expensive liquor, cars and watches. But the advertising picture for luxury magazines is bad. For instance, ad pages at American Express Publishing’s high-end magazine Departures fell 43 percent in the first quarter of the year, according to Publishers Information Bureau. And some magazines largely dependent on luxury ads have ceased operations recently, including Condé Nast Portfolio, Private Air and Trader Monthly. Mr. Di Benedetto said the title’s similarity to Cigar Aficionado was not intentional. “You can be an aficionado of many things, and the fact that it rhymes, I can’t help that,” he said. If you saw him rock out at last year’s Midnight Music and Munchies event at the New York City Wine & Food Festival, you know Tom Colicchio is a venerable axman. So how’d he master those Neil Young licks? Private lessons from Jefferson Airplane’s Jorma Kaukonen, according to an article in the premiere issue of Guitar Aficionado. 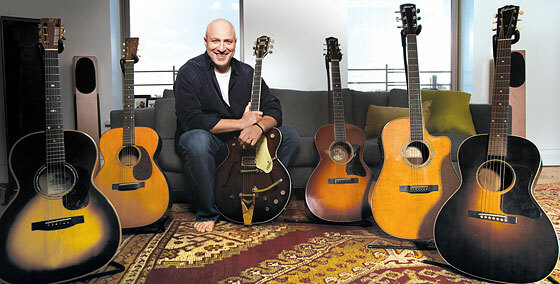 The magazine is described as a glossy about rich baby-boomer celebs and their very expensive guitar collections — and none other than Don Colicchio, whose collection is valued at $45,000, is on the cover showing off a $5,000 Gretsch that’s identical to the one George Harrison played. Best part of the article, which unfortunately isn’t online (you’ll have to pick up a hard copy for Colicchio’s wine recommendations), is when Colicchio gets all Lloyd Betnsen about the matter of rock-star chefs: “Let me tell you — I know a few rock stars. I’ve been out with a few rock stars. And we are definitely not rock stars.” And now, below: Perhaps the greatest photo you will ever see.